I’ve always been interested in my family’s history and ancestry. In high school, I asked as many relatives as I could what they knew about our ancestors and found out some interesting things about my family’s history. My dad’s grandpa was a bread baker in Belgium and my mom’s forebearers were one of the first families to farm hard red winter wheat in the western United States. All of my ancestors were immigrants to this country and I am grateful for the personal sacrifices they made and hardships they endured in coming to the US. Recently, with some incredible facilitated guidance from Transformative Alliances, I’ve taken a deeper look at my familial history and examined not only the interesting stories that have been passed down from generation to generation, but also the laws, policies, and current affairs that would have directly impacted my ancestors during their lives. This process uncovered and reiterated a lot of important context about how I became the person I am today. It reinforced something I already knew deeply: that my family and I inherited unearned advantages through the countless laws and policies that were explicitly designed to benefit my white ancestors. It also uncovered some unlikely stories of resistance that shaped my strong commitment to undoing these unfair advantages that persist today. Most prominently though, it highlighted just how contradictory and unfair our country’s immigration policies have been throughout our history. The 1790 Naturalization Act, which allowed “free white persons” who had resided in the US for at least two years to be granted citizenship, allowed my early maternal ancestors to become citizens of the US after their ancestors immigrated here in 1693. The 1882 Chinese Exclusion Act, 1924 National Origins Quota Act, and numerous other immigration policies paved the way for my Irish and Belgian paternal ancestors to immigrate and become citizens, while countless others were deliberately excluded from this path to citizenship, namely people of color. Throughout our country’s history, time and again, we’ve created laws—immigration or otherwise—that have preferenced the white race at the expense of people of color. And we are still doing it today. Numerous recent decisions by the Trump administration to restrict, or attempt to restrict, immigration from countries with majority people of color, have reinforced this harmful legacy. Congress’s lack of action around a clean Dream Act has meant advocacy organizations and policymakers have felt obligated to pursue stop-gap or alternative measures. In fact, enacted legislation related to immigration increased nationally in 2017 by 110 percent over 2016 as states scrambled to counter or enforce federal immigration policies. In Colorado, House Bill 1230 would create the “purple card” work permit program, which would allow immigrants without documentation who have paid state taxes for two years and haven’t had a felony conviction in three years, to be legally eligible to live and work in Colorado—what some are calling a green card equivalent. 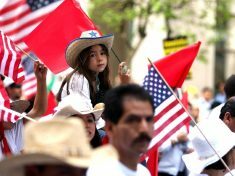 There are questions about whether this would derail efforts to advocate for a more permanent path to citizenship, and immigrant communities are divided in their opinion on it; Center for Health Progress has chosen to monitor this bill, as opposed to support or oppose it, in order to follow their leadership. However, states shouldn’t be forced into these decisions in the first place; it’s time for Congress to pass commonsense legislation that three-quarters of American support: a clean Dream Act. In a new report, we’ve laid out the clear implications of anti-immigrant laws on the health of our people and state, and have committed to supporting policy that improves the health, well-being, and safety of immigrants. And, we’ve seen the impact and understand the personal consequences of unfair and imperfect immigration policies, which have persisted throughout our country’s history. But we know immigrants don’t have the luxury or privilege to wait and see how these new laws and policies will play out; they’re living the effects every day. So I ask, what can you do today to start undoing America’s racist legacy?